Linear motion has traditionally required separate components to handle both drive and support/ guidance. The compact Kerk® ScrewRail® combines both functions in a single, coaxial component. By eliminating the need for external rail-to-screw alignment, the ScrewRail simplifies the design, manufacture and assembly of motion systems. The ScrewRail’s coaxial design saves as much as 80% of the space used by a two-rail system and is generally less expensive than the equivalent components purchased separately. The savings can be substantial due to lower component costs and reduced labor. An added benefit is the ability to get three-dimensional motion from a single ScrewRail. 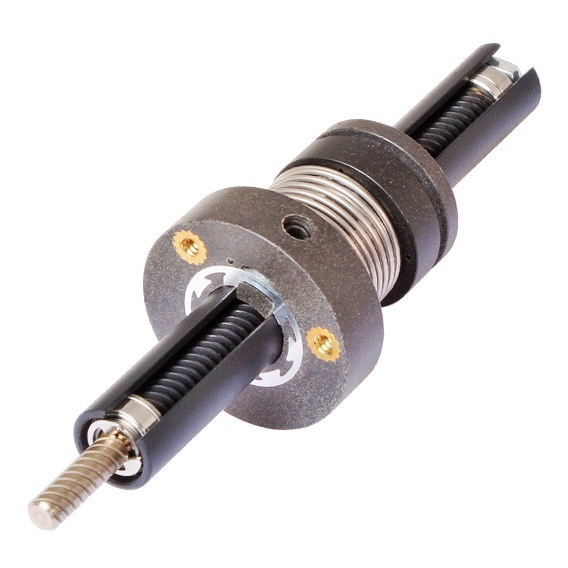 The ScrewRail consists of a precision rolled lead screw, supported by sealed bearings and contained within a concentric steel guide rail, driving an integrated nut/bushing. Because all the alignment requirements are achieved within the ScrewRail, support and positioning of the ScrewRail is much less critical than with traditional slide assemblies. Kerkote® TFE coating and self-lubricating nut/bushing materials ensure long life without maintenance. When mounted vertically, the ScrewRail can be used to simultaneously lift and rotate (Z-theta motion). With one motor driving the screw and a second rotating the rail, a compact, self-supporting pick and place mechanism can be created. A nut designed and manufactured with our unique axial take-up mechanism providing continuous self-adjusting anti-backlash compensation. Note: Right-hand/Left-hand ScrewRail® assemblies are also available. *ScrewRail® stiffness may be modeled using Classical Beam Deflection Theory with equivalent stainless steel beam of diameter given. ** Other leads available as custom orders. As an additional option for all Kerk® ScrewRails, standard End Supports offer the convenience of simple and compact mounting for the ScrewRail. The End Supports are designed to slide over the outside diameter of each end of the rail and “key” off the slot in the ScrewRail. The Kerkite® composite polymer End Supports come standard with three hex nuts that are captured in the flange for easy assembly. The End Supports are also supplied with a brass threaded insert and a set screw to fasten to the outside diameter of the rail. With the End Supports, the Kerk ScrewRail can be easily mounted to your assembly. However, if the End Supports are not utilized it is recommended to center the clamping force on each end at the L3 dimension as shown in the drawing below.